From a philosophical and psychological perspective, Tisha B’Av became the most significant Jewish observance over the past two millennia. Tisha B’Av revolutionized the status quo of life, and turned our experience of time on its head. In the normal experience of time, each day, week or month is viewed as predominantly a positive experience in which one desires to continue and partake in what life has to offer. On occasion, a tragic event or interlude interrupts this flow of time and the individual pauses to absorb the tragedy, live through it, and then regain his previous life. This normal dynamic of life has been totally undermined by the experience of Tisha B’Av which in Rabbinic tradition became an unending experience. Jews feel or should feel a sense of loss which is impossible to be fully healed. Thus, normal life could never be retrieved. In a sense, that loss should be greater than a personal tragedy of death, for even in the experience of losing a loved one, there is law which forbids us to grieve too much. One should not presume to love the deceased more than God. There is, however, no such application of not grieving too much to the experience of Tisha B’Av. The sense of irredeemable loss becomes part of our normal experience. That continues to be so, until the appearance of the Messiah. The underlying foundation of this loss is expressed or demonstrated in the process of mourning. The Talmud states, “All the restrictions that apply to a mourner, also apply to Tisha B’Av. It is prohibited to eat and drink and to anoint, and to put on leather footwear, and to engage in marital relations.” Taanit, 30a. The Braita also includes any form of Jewish study which could bring about pleasure or joy. Although, as the commentaries note, the Braita is imprecise. A mourner is not forbidden to eat and drink, and there is no mention of the prohibition of washing, which applies both to a mourner and to Tisha B’Av. Nevertheless, the dominant aspect of mourning applies to both. The underlying principle behind the correlation of Avelut and Tisha B’Av is the realization that without the Temple, Jews live incomplete and unfulfilled lives. Its absence creates a deep hole or vacuum in Jewish life. 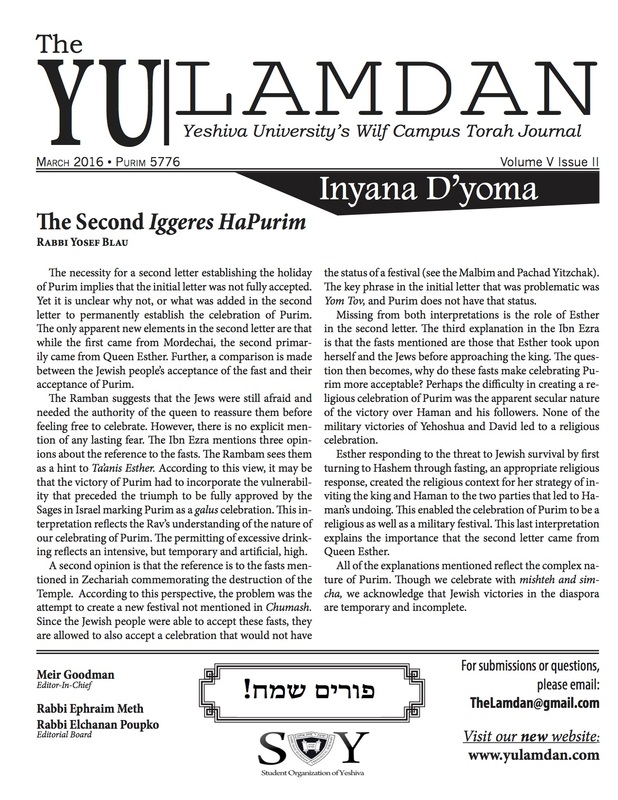 This loss, however, is emphasized on a deeper level when the Talmud establishes a connection between Tisha B’Av and Yom HaKippurim. There is no distinction between Tisha B’Av and Yom HaKippurim except that when doubt occurs, it is prohibited on one and permitted on the other. In every other way, they are both equal. Pesachim 54b. The issue of doubt refers to a situation where there is uncertainty as to what the specific date of either of these occasions is. On Yom HaKippurim, two continuous days must be observed, while on Tisha B’Av, only one day. That is because Yom HaKippurim is a Torah holiday, while Tisha B’Av is a Rabbinic holiday. It is clear, however, that the issue of mourning plays no role whatsoever in the observance of Yom HaKippurim. There is no requirement to sit low to the ground, or any restrictions upon what Jewish texts can be learned and no restrictions on mutual greeting. What does remain, however, is a sense of personal loss. In our striving to become as great as the angels, we experience the loss of our normal humanity. We cannot sustain that experience for any great duration. Nevertheless, that is exactly what the Rabbis wish us to experience for the duration of our lives, through their understanding of the gravity of Tisha B’Av. The Talmud informs us that when the Second Temple was destroyed, the Rabbis wished to prohibit all manner of food or drink that was connected with the Temple ritual. Thus, meat and grain products should not be eaten because they were offered as sacrifices in the Temple. Wine should not be drunk because it was offered as libations. And even water should not be utilized, because on Sukkot, it was also used for libations. Rabbi Yehoshua tried to moderate this approach. He stated, “not to mourn at all is impossible, for the decree has already been rendered. To mourn too much is impossible, for we cannot impose upon the community regulations which they cannot sustain.” Bava Batra, 61b. The compromise he instituted was symbolic in nature. It assured that the Temple and its destruction were not to be forgotten, but it also demonstrated that without the Temple, Jews could not live complete lives. Thus, homes could not be totally plastered, women and essentially brides, would limit the amount of Jewelry they could wear and bridegrooms would place ashes on their foreheads at the place of laying of the Tefillin. See Ibid. In this way, memory of the destruction would always be a significant aspect of our lives, especially during moments which would be especially joyful. Rabbi Yishmael ben Elisha, carried this sense of loss to its ultimate extreme. From the time that the evil empire (Rome) spread, who decreed upon us cruel and harsh edicts and nullified the learning of the Torah and fulfilling its commandments and prohibited circumcision, it should be the law that we should not marry and give birth to children and should allow the seed of Abraham to cease of its own accord. However, we should allow Israel to do what it wants (for we know that they will not obey this law). It is better that they sin unintentionally, rather than they sin with premeditation. Ibid. This is an astounding conclusion, that the concept of maintaining the continued existence of the Jewish people is considered a sin. That it is better for the people of Israel not to exist at all, rather than to exist under conditions without a Temple and under harsh decrees which would threaten their spiritual existence. The lesson we derive is that without God, life is not worth living. What sustains our lives and enables us to deal with our loss is the unquestioned certainty of God’s redemption. This will be revealed to all with the coming of the messiah quickly in our time. Rabbi Dr. Chaim Schertz received his semicha from Yeshiva University in 1969. He also received masters in Jewish Philosophy from YU’s Bernard Revel Graduate School. He has a second Masters in the History of Ideas from New York University, and a Ph.D. from New York University in the History of Western Thought. He taught Classics at Pennsylvania State University and Philosophy at Regis College in Denver, Colorado. Rabbi Schertz served as the Rabbi of Kesher Israel Congregation in Harrisburg, Pennsylvania for over 25 years and is currently retired and living in Harrisburg.